One eye on the streaming video, the other on the blog. Starting to look a bit like winter here on the prairies ... a little snow filtering down. Here come the teams! Get behind the boys! The players are back in the tunnel and kick off is less than five minutes away! 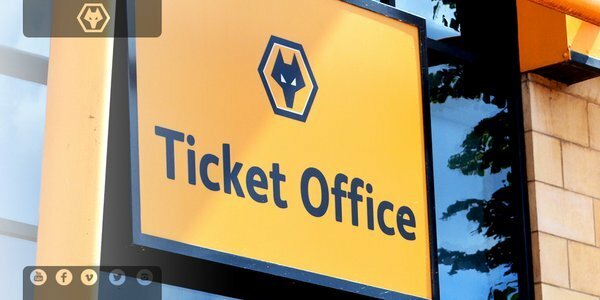 COME ON WOLVES! Good evening everyone. Is the blog working? No comments coming through. Hi from an unusually warm Canada. 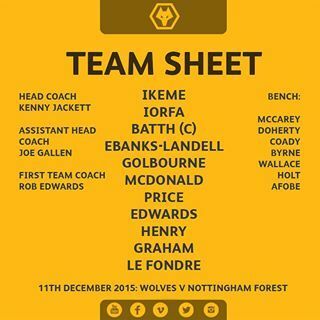 Disappointed Afobe is not playing but as long as we win all will be forgiven. Too ill to travel to Molineux tonight; so will have to suffer online from cold and damp Suffolk. Can't call any match this season; on our day can beat anyone, but can also lose to any other team on a poor day. Here's hoping for a good one! Interesting to see that our visitors Forest have two former Wolves players in their starting XI, goalkeeper Dorus De Vries and centre half Michael Mancienne. It's a cold but dry evening at Molineux. Just under 20 minutes to kick off and both teams are still on the pitch going through their final preparations. What's the weather like for the game? Thoughts on our team Wolves fans? Are you confident of a win? I didn't think he would leave but now starting to doubt that, he can't be as happy has he was, he was scoring for fun in a team that was moving closer to the Prem. Now he's struggling for form in a team that has sold 2 of it's better players and not replaced them and then the Chairman effectively leaves us in limbo. Who would blame him if he were to take a bigger better contract offer to play in the Prem. In his situation I know what I would do! Preparing us for Jan` Davo? Evening all. Jackett still giving Afobe his full backing then! Tonight's team news coming up shortly. Good evening from Molineux for tonight's Sky Bet Championship match with Nottingham Forest. Both teams head in to the match in good form and it should be an entertaining game. Very good luck to @_nick_bennett in Masterchef. Hopefully our lads are also going to cook up a storm this evening!!! ACADEMY | Good reaction to the Stoke defeat from the Under-21s but edged out 2-1 at Newcastle with @EusebioGomes7 on target. ACADEMY | Under-21s heading towards full time 2-1 down at Newcastle. @EusebioGomes7 equalised but then Toon restored lead.